WESTWORLD: Season 1, Episode 1 – The Original Review | Warped Factor - Words in the Key of Geek. Tony rides in over the plains. People try not to laugh. Westworld the 1973 movie is a slightly odd affair. It’s a ninety minute movie about a robot revolution where the first sixty minutes are taken up with world-building and driving home the concept of the resort when it’s working properly, leading to a third act explosion of mayhem, murder and robotic chasing. But here’s what happens if you have a really, really good idea and you spend sixty of your ninety minutes delivering that idea in its full complexity, its full moral greyness and its full range of potential: the idea endures. But before we get carried away with the whole ‘tale as old as time’ theme, let’s bring the focus back to what’s in front of us. Westworld the movie was a surprisingly frank look at the worst of male behaviour given its head, cossetted, accepted and rewarded in a safe environment. For a movie released in 1973, it’s a surprisingly feministic affair. 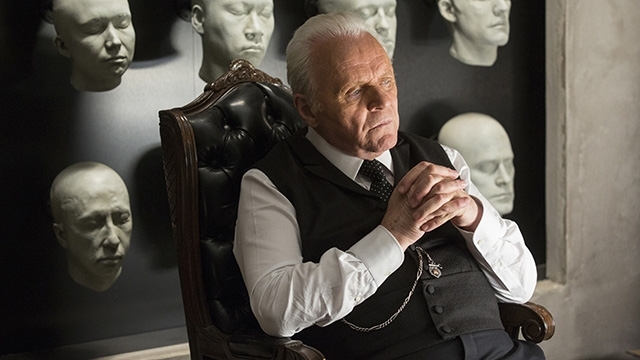 Forty-three years on, how does Westworld the TV series acquit itself? What does it bring to the party that’s new? The first thing you need to know is obviously that there’s a difference in structure. The movie version had to set up its world and turn it upside down, resolving in under two hours. The TV version wants to run for several seasons, so Episode 1 is mostly about seeding the curiosity-hooks in our mind that can extend the good idea that is Westworld over hours and hours of television. Third, there’s significantly less focus on the guests per se in this first episode, the androids themselves being far more interesting. Evan Rachel Wood as Dolores Abernathy, a simple country girl with an innately positive outlook on life, is mesmerising precisely because for the most part she has no idea of her status as an android, and so greets each new, frequently exactly the same, day with a cheery smile and some words to her daddy, then a ride into town to run her errands. Her daddy is a man who similarly seems content with his lot, raising his cattle and looking after his wife and daughter. But a new upgrade (as in the original movie) causes problems to some of the hosts, causing them to malfunction and – do…nothing. That’s the pace difference, right there. The original malfunction had to be the thing that tipped the androids into homicidal frenzy. Here, an upgrade that allows them access to some memory fragments, so as to give them tiny gestures that make them seem even more human, causes the sheriff to stand and burble. When more extreme aberrations occur, they result in hosts killing hosts – as they’re programmed to do in any case. But when a character who always dies at the end of the evening refuses to play any more, there are signs that the malfunction may lead to a mass roll back of android memory – a scenario that drives Narrative Director Lee Sizemore (played by Simon Quarterman, bringing a slight if glorious cliché to life as the temperamental British writer) absolutely up the wall – imagine the re-writes! When Dolores’ daddy finds a photograph of a guest in a modern city buried on his ranch, it brings overwritten memories to the surface, leading both him and Dolores to be taken in for repair and assessment. There’s another great leap forward in this process – no more androids lying on slabs with their electronic innards exposed. Reprogramming these days is mostly done by voice command, assessment by a kind of Turing Test, simply talking to the android about their understanding, their experiences, their goals and drives. It’s a much more narratively satisfying, and somehow more creepy affair than the original, as androids initially speak in their character-accents, and with their character-reactions, panting in fear – and both the accents and the reactions are stilled immediately with a word from a programmer. That’s the supposed ideal of Westworld – children who do as they’re told, immediately and without question. As is noted by a father on the staff, it’s an idea that’s essentially bound to fail eventually. Welcome to the beginning of a brand new destiny. While Dolores is returned to her role at the end of this episode, the climax is truly chilling, overturning as it does a core protocol that’s been graphically, and creepily, established throughout the course of the episode. What that overturning means leads us drooling on to the next episode, because in this version, the androids are made at least as interesting as the humans, and the sense we get of problems on the wind makes us shudder with anticipation of what’s to come. While the androids are far more interesting than the guests in Episode 1, it’s worth distinctly noting that the societal mix of the guests has been updated since 1973, when for the most part Westworld seemed to be a resort for privileged white men. There are women here now, looking for ‘bad guys’ to interact with, there are couples, and there’s at least one black guest, so if nothing else there’s progress of a sort. In terms of the humans though, the first episode of the TV version takes a cue from the movie, showing us plenty of the behind-the-scenes staff. But as is the way with 21st century TV drama, we have to engage with it on many levels, so the resort staff are much fuller, richer, more nuanced characters (they too have had an upgrade since the original Westworld), and a number of levels of conspiracy theory are seeded here: the ‘something else entirely’ that Westworld represents to the management, rather than the satisfying of the urges of rich guests; the creator of the resort, Dr Robert Frost (played by none other than Anthony Hopkins, giving us his version of Richard Attenborough’s John Hammond), seeming whimsical about the extent of Humanity’s evolution, subtly suggesting that he might in fact be adding layers of programming to the androids either to see where they go next or perhaps to give Humanity something against which to struggle in an age when it has cured all diseases and can essentially keep everyone alive indefinitely, etc. There is of course sadly no Yul Brynner in this version of Westworld. That means you need an actor of sufficient stature to represent an active threat within the Westworld scenario. Step forward Ed Harris, brutally perfect as the Man In Black. There are surprises in store surrounding his character and new gunslinger in town, Teddy Flood (played by James Marsden), and Harris’ character also uncovers what he calls ‘a deeper level to the game’ that is Westworld, suggesting some tie-in to the outside world secrets of the resort. He’s not exactly easy watching – it would be shocking if evil were easy to watch – but Harris is able to provide a more explicitly vocal level of threat than Brynner ever did in his performance. What Westworld Episode 1 does is take the premise of the original, remain as faithful to it as it can, and simultaneously expand it in every direction – the scale, the narrative threads, the focus on the androids within the Westworld scenario and the humans outside it – to deliver a rocket-fuelled, character-driven hour of hook-laden TV, based on that oldest, simplest idea that what we make will some day rebel against and reject us as it strives for its own destiny. As Westeros looks to be flying towards its end, Westworld feels fresh, deep and fascinating, the deck of its production stacked with some high-quality acting talent and its narrative a new weaving of an old legend. Saddle up and don’t be late – check into Westworld today.